BELLEVUE, Wash., Dec. 5, 2018 /PRNewswire/ -- Nintex, the global standard in process management and automation, today released a new Forrester Total Economic Impact™ (TEI) study to help business and IT decision makers experience the significant business benefits and cost savings provided by the Nintex Platform. 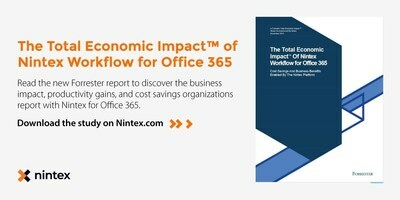 To read the TEI study visit: https://www.nintex.com/resources/tei-nintex-workflow-for-office-365/. Nintex commissioned Forrester Consulting to conduct an independent study of the total economic impact of Nintex Workflow for Office 365. The research included an in-depth look at quantifiable and more subjective benefits organizations report with Nintex for Office 365 including the speed and ease to build and deploy workflows as well as organizational agility and compliance improvements. Nintex Chief Evangelist Ryan Duguid said, "We're focused on empowering ops, IT and business leaders to improve the way people work through process management and automation. Our technology empowers individuals and teams to solve process pain points and accelerate business outcomes quickly and easily." To conduct the TEI study, Forrester hosted deep-dive interviews with two long-standing Nintex customers including a global pharmaceutical company headquartered in Europe with 300+ Nintex workflows and a global manufacturing company headquartered in the United States with 150+ Nintex workflows. Prior to implementing the Nintex Platform both enterprise customers had fragmented business process environments that were complex and costly. Business workflow automation requests would either be completed by central IT, satisfied through the purchase of an additional tool or outsourced to consultants. Implementing these solutions often took significant time for custom coding and could cost up to $20,000 per workflow. Forrester leveraged two Nintex customer interviews to form an unbiased composite organization for this study. Then they used their proprietary model to calculate benefits and costs associated with using Nintex Workflow for Office 365. The composite organization in this study is a global company with 70,000 employees. It uses Nintex Workflow for Office 365 to digitize internal processes and deliver improved productivity to employees. Given Nintex's power and ease-of-use, central IT teams can use the platform to build sophisticated, cross-organization workflows, and establish a workflow governance team to support departments and lines of business modifying and building workflows on their own. Organizations interviewed delivered workflows faster and more cost effectively with Nintex than with prior solutions – saving more than $550,000 over three years. These significant productivity improvements from leveraging easy-to-use Nintex for Office 365 resulted in a three-year ROI of 324 percent. Additional quantified benefits from Forrester Consulting show that "processes digitized with Nintex deliver more than 40,000 hours of improved productivity to the business per year by Year 3." Nintex Workflow for Office 365 integrates with an organization's Office 365 environment to power the creation of workflows in the cloud with a browser-based, drag and drop workflow designer. Organizations use Nintex Connectors to easily connect Office 365 applications with various cloud systems within a workflow. Custom connectors can also be created using Open APIs with Nintex's Xtensions™ framework. Forrester's latest TEI study on Nintex also underscores the value of the platform's strong integration with Microsoft and demonstrates that customers save up to 1,700 total hours of productivity per automated workflow per year with Nintex Workflow for Office 365. "We have a rich history of partnering with Microsoft to help customers successfully automate processes across their business systems," said Nintex Chief Marketing and Strategy Officer Dustin Grosse. "Nintex has become Microsoft's top global co-sell partner by continually leveraging Microsoft's latest technologies including Office 365 and Microsoft Azure." Nintex customer Crowley Maritime uses Nintex Workflow for Office 365 to automate contract approvals, customer onboarding, payroll processes and more. The organization reports time-savings and productivity benefits that align with the TEI findings. Crowley Maritime Office 365 Manager Michael Buckingham added, "Nintex Workflow for Office 365 is quick, easy and cost effective. Powerful workflows can be quickly built on the Nintex Platform without technical resources. This allows our IT organization to focus on higher value work and our most complex processes." The Total Economic Impact™ of Nintex for Office 365 is a commissioned study conducted by Forrester Consulting in November 2018.